Arnold diffusion is a phenomenon of instability observed in Hamiltonian systems with more than two degrees of freedom. Hamiltonian systems appear naturally as models of many systems with negligible friction. For instance, the models in Celestial Mechanics or the models for motion of charged particles in magnetic fields. The problem arises when one studies the effect of periodic small perturbations on these models. Two phenomena can take place: either perturbations average out (stability) or they accumulate over time (instability) and one can gain energy with arbitrarily small perturbations. One can think of a satellite that moves using only the force of the planets. The existence of this latter phenomenon was observed first by Arnold in a particular example. The results of the group have shown that this is a more general phenomenon in Hamiltonian systems. The current projects of the group in this area focus on both theory and applications, specially to Celestial Mechanics, where the techniques developed in the theoretical papers are being successfully applied (analytically and numerically) to study the existence of instabilities in these models. 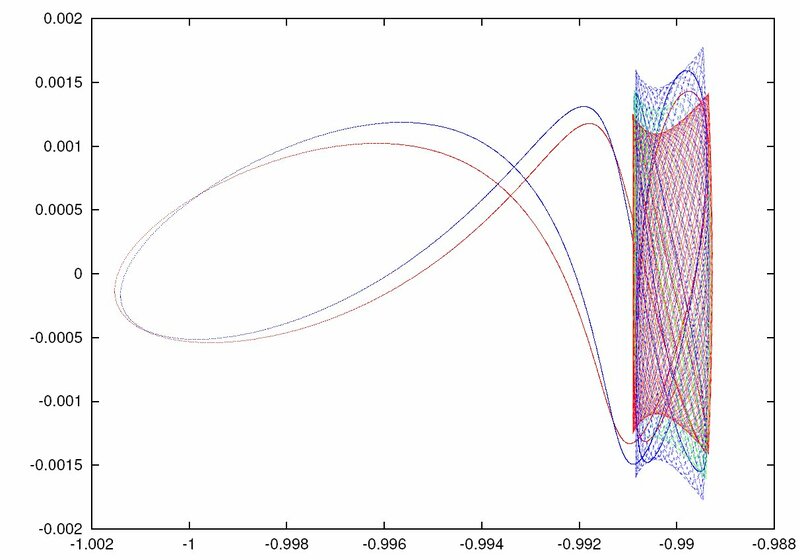 Illustration of the diffusion orbit of a small body along 3 invariant tori in the spatial Restricted Three Body Problem. The small body (e.g. a satellite or a spacecraft) is driven by the gravitational attraction of the Sun and the Earth. These invariant tori (shown in red, green, and blue) belong to the normally hyperbolic invariant manifold of the equilibrium point L1. The trajectory of the small body starts at the blue torus, then "jumps'' along the blue homoclinic orbit onto the green torus, and finally it ``jumps'' again along the red homoclinic orbit onto the red torus.